Skip June 22, 2015 Destinations, RECENT, Slide No Comments on Bahamas: How would new flats regs effect your fishing? Concessions to fishing lodge operators. A fishing lodge operator certified under regulation 5 may apply to the Minister of Finance for customs duty exemptions in respect of items listed in the Fourth Schedule and imported for retail sale to anglers. An application under paragraph (1) shall be made in duplicate and one copy each submitted to the Minister of Finance and the Minister responsible for Marine Resources respectively. The Minister of Finance may, on the recommendation of the Minister responsible for Marine Resources, grant customs duty exemptions to an applicant under paragraph (1). Stafford Creek Lodge, Andros Island, Bahamas. Commercial fishing in the flats prohibited. No person shall engage in commercial fishing in the flats. A person who engages in commercial fishing in the flats commits an offence and is liable on summary conviction to a fine not exceeding five thousand dollars, or to imprisonment for a term not exceeding three months, or to both fine and imprisonment. Source: Tom Karrow. For more information on Tom’s Bahamas initiative click here . 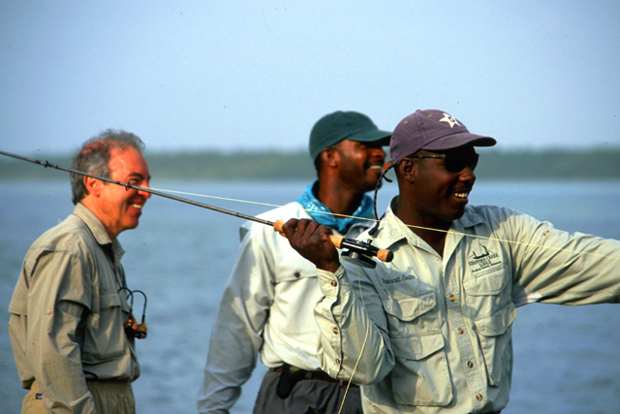 . .
Read complete proposed legislation for Bahamas anglers of the flats . . .